This is for anyone who has felt the pain of ridicule for not “fitting in”. Not fitting into an idea, a cultural conception of “normal, of “appropriate”. These women’s responses to ridicule are nothing short of inspiring and empowering. They could easily give into the societal pressure and shaved their faces to please others. Sometimes it seems easier to fit in, but the message that is sent when you stand out is much more powerful. These women not only stand tall but they shine bright as examples of confidence and self-love. They are beautiful inside and out. When we fully accept and love ourselves we spread the energy of non-judgement, and acceptance just by being ourselves. How much more beautiful can you get? Harnaam’s brother Gurdeep was her biggest support. Always reminding her she looks beautiful with her beard and the most important thing is her happiness. Harnaam Kaur who was diagnosed with polycystic ovary syndrome, started having excessive hair growth on her face at 11 years old. At one point she was driven to self-harm by bullies who teased her mercilessly, and lack of support from parents who feared she could never lead a “normal” life. 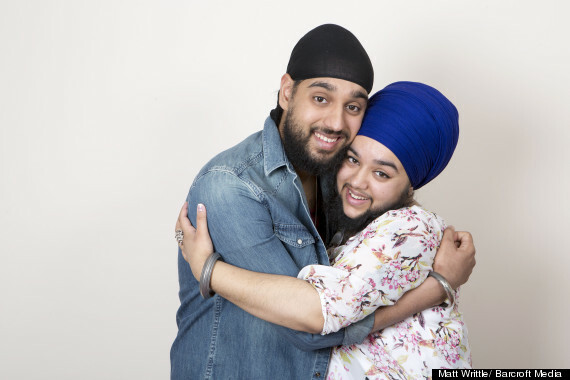 Kaur, now 23-years has embraced her condition and now proudly sports a full beard stating she feels more feminine than ever. “All that matters to me at the moment is that I love myself. I love my beard and all my other little quirks – my tattoos, my scars, stretch marks and blemishes. “I want other women to find the strength that I have. Balpreet’s eloquent response to a tasteless Reddit post targeting her facial hair has not only sparked virtual applause online, but also inspired a deeply apologetic reply from the original poster (see below). A photo unknowingly taken her was posted on the website’s “funny” thread, prompting a string of cruel comments. When the neuroscience student saw them, she added a message of her own. Hey, guys. This is Balpreet Kaur, the girl from the picture. I actually didn’t know about this until one of my friends told on facebook. If the OP wanted a picture, they could have just asked and I could have smiled 🙂 However, I’m not embarrassed or even humiliated by the attention [negative and positive] that this picture is getting because, it’s who I am. Yes, I’m a baptized Sikh woman with facial hair. Yes, I realize that my gender is often confused and I look different from most women. However, baptized Sikhs believe in the sacredness of this body – it is a gift that has been given to us by the Divine Being [which is genderless, actually] and, must keep it intact as a submission to the divine will. Just as a child doesn’t reject the gift of his/her parents, Sikhs do not reject the body that has been given to us. By crying ‘mine, mine’ and changing this body-tool, we are essentially living in ego and creating a separateness between ourselves and the divinity within us. By transcending societal views of beauty, I believe that I can focus more on my actions. My attitude and thoughts and actions have more value in them than my body because I recognize that this body is just going to become ash in the end, so why fuss about it? When I die, no one is going to remember what I looked like, heck, my kids will forget my voice, and slowly, all physical memory will fade away. However, my impact and legacy will remain: and, by not focusing on the physical beauty, I have time to cultivate those inner virtues and hopefully, focus my life on creating change and progress for this world in any way I can. So, to me, my face isn’t important but the smile and the happiness that lie behind the face are. 🙂 So, if anyone sees me at OSU, please come up and say hello. I appreciate all of the comments here, both positive and less positive because I’ve gotten a better understanding of myself and others from this. Also, the yoga pants are quite comfortable and the Better Together tshirt is actually from Interfaith Youth Core, an organization that focuses on storytelling and engagement between different faiths. 🙂 I hope this explains everything a bit more, and I apologize for causing such confusion and uttering anything that hurt anyone.